I hope you are all doing fine and adjusting to the changing weather of this lovely October. Today it's the first day of autumn rain in Toulouse, so it seems about right to present the last of my summer makes. It has rapidly become on of my favourite dresses. It's the Rumi Tank by Christine Haynes. She recently released this dress as the first of the collection "Chop chop make it today": it is supposed to be a series of quick to make PDF patterns. This one was quick indeed! 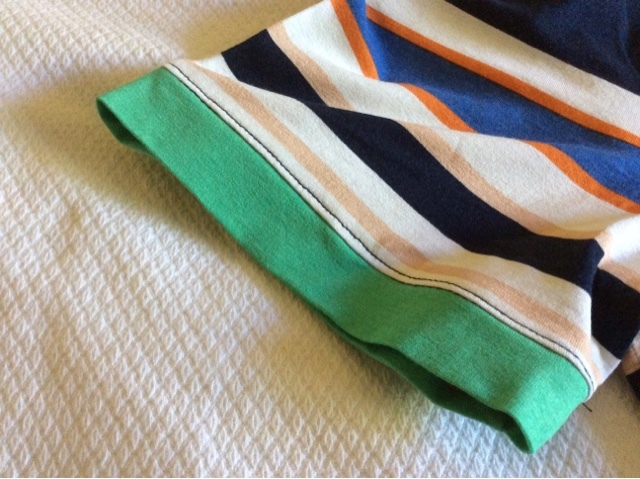 Let's start by saying that I have bought it immediately as I saw it, already with a fabric in mind from my stash, and the association has worked perfectly. Sewing time has been very little and satisfation quite big, so a great deal altogether. 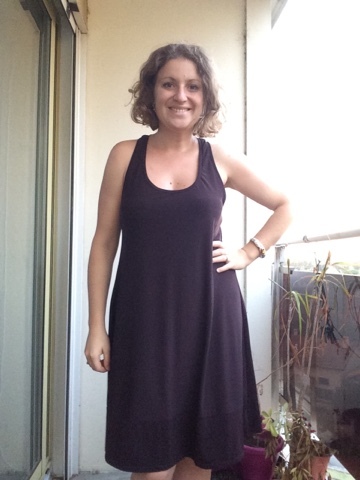 Rumi is a tank dress with gracious fit and feminine shape, designed for lightweight knits. 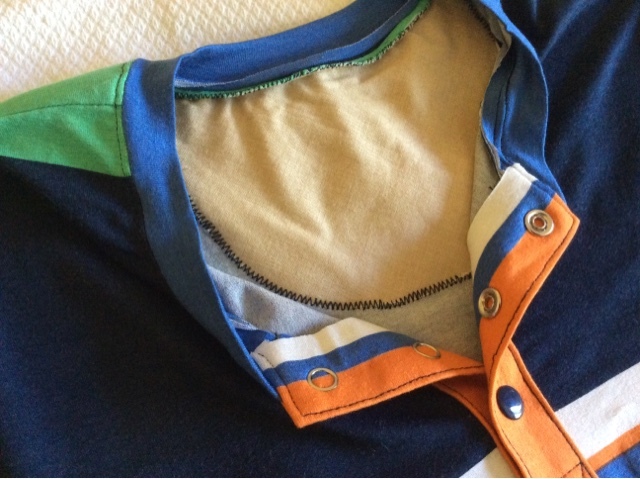 Neckline and armholes are finished by bias binding. It features the typical racerback tank shape at the back, which sits nicely on the shoulder blades, and a scoop neckline at the front, very feminine but not too revealing. The shape and look can change a lot accordingly to the choosen fabric. In my mind I saw it as the perfect project to finish up some fabric leftovers from my first (and last) online fabric shopping. It has not been a very successful one, since the weight of this brown fabric turned out to be too thin for the sportswaear I intended to sew. On the other hand, it is great for a swishing dress with simple style lines. The dress has an optional wide hem band, which you can make in contrast fabric. 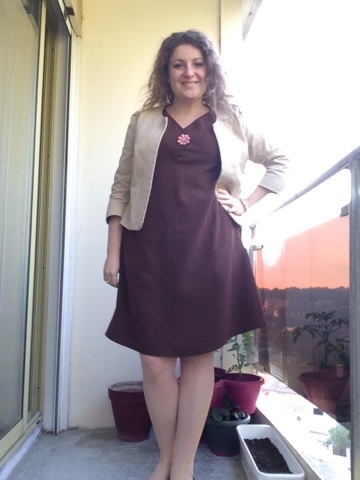 I wanted an all brown look but could not fit the long pattern pieces on my fabric leftovers, so I pieced it anyway and I am happy with the result: I think it adds interest to the hem band, which is something I usually appreciate. 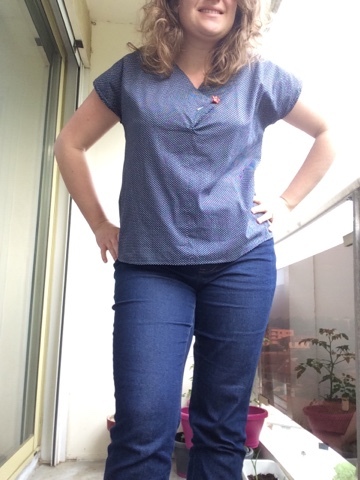 I have made a straight size 14 (thanks to my new measurements, yay) with no patterns adjustments (yay), and I am happy about the final fit (yay yay). The pattern is designed to have negative ease at the shoulders and bust, and positive ease at the waist and hips, great combination if you ask me! 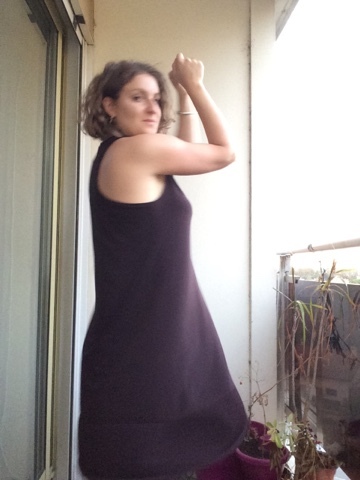 I have been wearing the Rumi dress ever since I made it, because it is comfortable and easy to layer under a cardigan or a scarf. 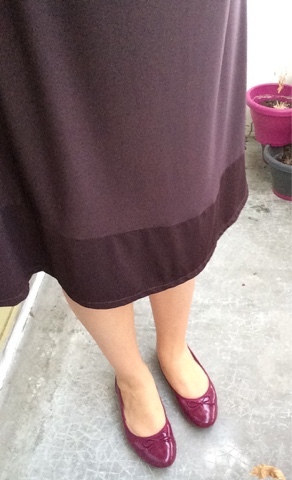 It can be dressed up or down with high heels or ballerinas, and I am sure I will make more of it. 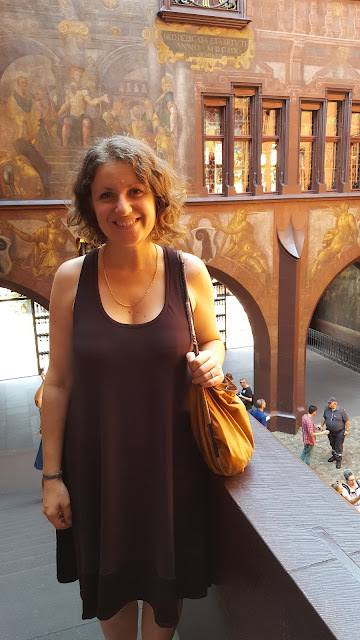 It also is the perfect travel dress: as you can see I have made good use of it while sightseeing in Basel one month ago with Chéri. I like a lot the tank shape, and will make for sure the top version, which is also included in the pattern. It's been almost four months I don't write here. The last time you left me before my first WeightWatchers meeting, and rest assured this is the main reason I have not written anymore. 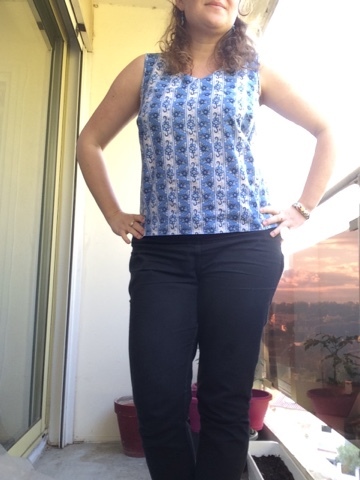 WeightWatchers works, and I now have roughly 10 kg less! 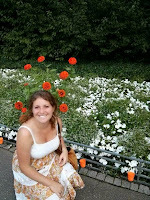 I am not out of breath anymore and my lifestyle is more active and healthy in general. 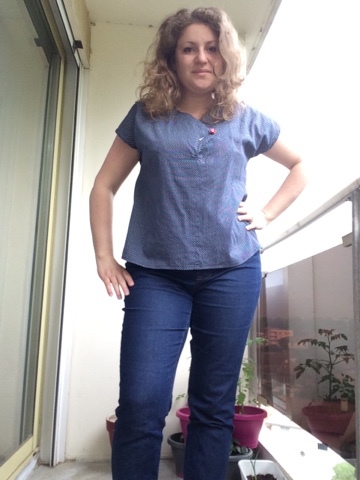 Speaking of sewing my own clothes, my body measurements have changed a lot of course: my body now has totally different proportions and shape than it used to have before. Still, my weight loss journey is not over: I am still overweight and my body will change again, both in measurements and general shape. As you can imagine, all my clothes are quite big for me right now, but I don't feel like sewing new ones, because it is a lot of effort for something that will not necessarily fit in a few months more. I've tried to buy, but well let's just say I am not used to be in RTW clothes anymore. Have I been sewing these past months? Yes of course! I have had some dull moments because of intense workload, but sewing is still my passion. 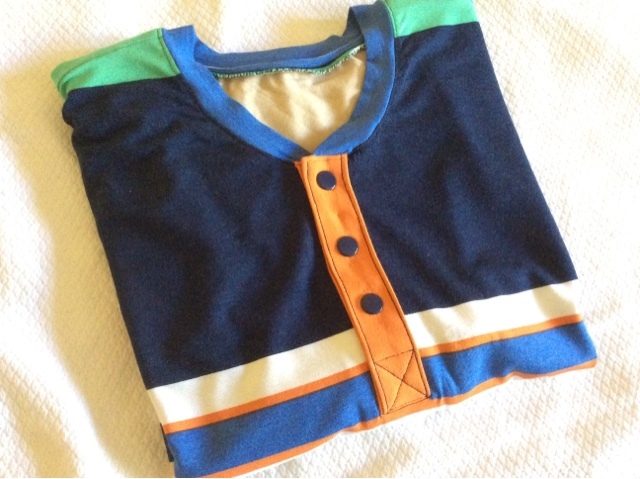 Among other things, I have been sewing for Chéri, and that is what I am going to show you today: a man pajamas top. It is the Eugene henley by Seamwork Magazine. It is not necessarily sleepwear, but that's what I have chosen to do with it. I particularly liked the small details which make it precious, like the button placket, the side vents, the back neckline reinforcement. As you can see, I had quite a lot of fun playing with stripes and colours. Fabric is a priceworthy find in the remnants bin in Toto Tissus in Toulouse. I still have some left, let's see what I can make with it. 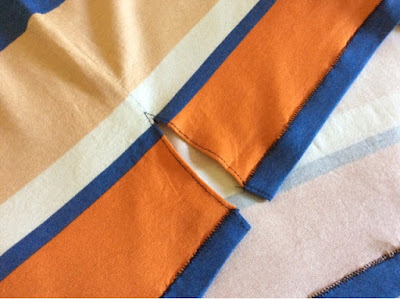 You might notice that pattern matching is not perfect, and I am sorry to do so but I blame my sewing machine which is not capable anymore to deal with very thin and stretchy fabric without overstretching it. 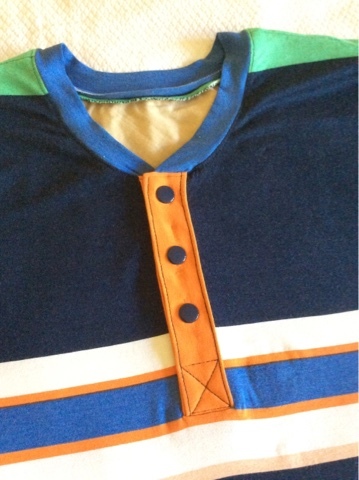 It was my first button placket and my first time installing snaps. It all went well, instructions are clear and it's a quick and gratifying make. It has definitely kept my sewing skills awake in this awkward transition period of my sewing life. In case you want to join the Seamwork Magazine, you can earn have 1/2 off your first month, and I'll get one free month if you follow my referral link. So, almost half of May has passed by (say what? ), and I feel it is time to spend a few words on Me Made May. First thing to say, is that I have spent one week of holidays in Edinburgh and in the amazing Isle of Skye, in Scotland. I am in love with this country and its people. The trip has only confirmed this feeling. Apart from my rumblings about Scottish people and food and drinks and places, one week of holidays means a compact travel wardrobe. Enter my Ginger jeans. Second thing to say, is that I have gained a few kilos more. While this is not the first time, I feel that these particular kilos put me on the other side of my personal limit. I am convinced that feeling pretty is quite a personal decision and boundaries are best when self set. One of my gurus on the topic is the character Agrado from the movie All about my Mother (by Almodòvar). I don't remember the exact quotation but the idea is that "we feel authentic when we resemble to the idea we have of ourselves". I believe this is true, and my idea of myself involves me being able to climb a flight of stairs without being out of breath, so something has to change from my current situation. For the first time in my life I feel motivated to actually do something serious about my health, I have spoken about this with a couple of doctors I trust, and both have suggested me to try Weight Watchers. 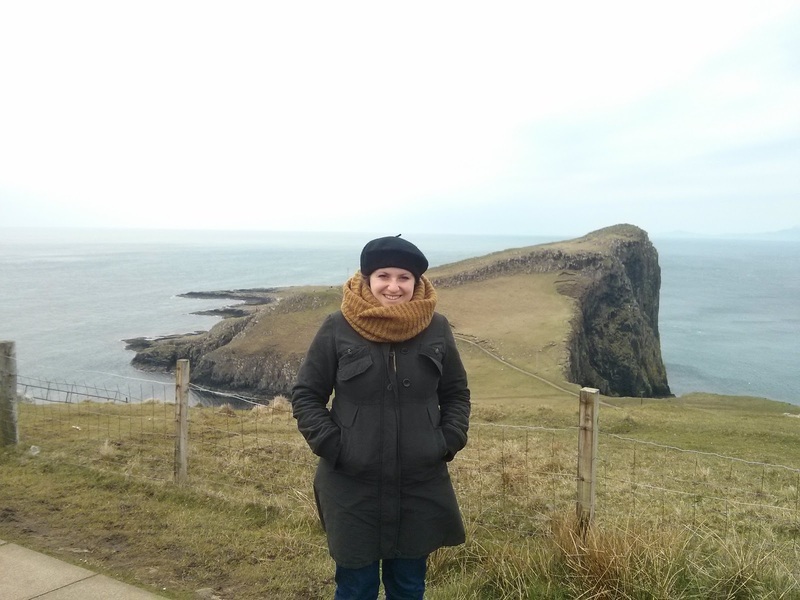 Chéri has been encouraging about this, too, and reminded me that whatever I do to my body I do to our happiness together in terms of health and hopefully long life together (more on that at the end of the post). The same goes for him, of course: we want each other to be healthy and happy together. We had a recent scare about that (everything turned out to be fine) so we are appreciating the idea of just being healthy. Of course I am not saying a few kilos more means lack of health, far from me to be the judge of that. I am just saying, that my personal idea of myself involves an active body with a few kilos less, and kilos are only an external sign, not the main point of my personal consideration. Anyway, tomorrow I am going to my first WW meeting and let's see what happens. 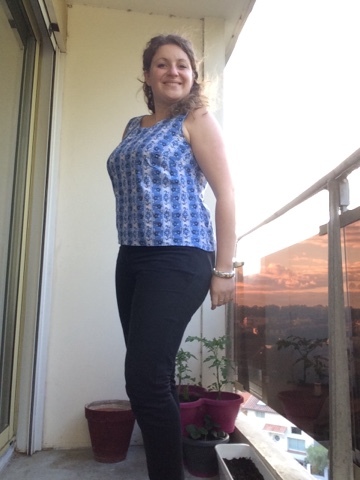 Sorry for the personal unload, I didn't plan this post this way, but then the words just came out, and I have decided to leave it like that, since it is indeed a reflection on my body, my style, my confidence and my clothes. Perfectly in line with Me Made May rationale. 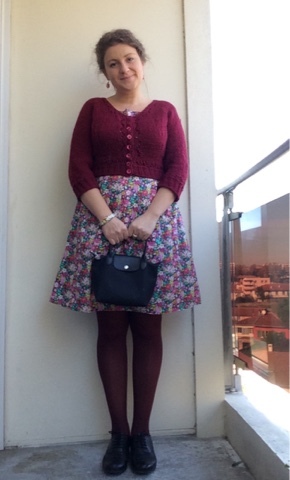 Speaking of which, more kilos mean that most of my dresses and trousers do not fit anymore. Enter my Ginger jeans. I have not presented them on the blog yet, but by now you have seen them a lot in my MMMay pictures. You might be wondering if I even own other trousers, and the answer is yes but they don't fit me anymore... 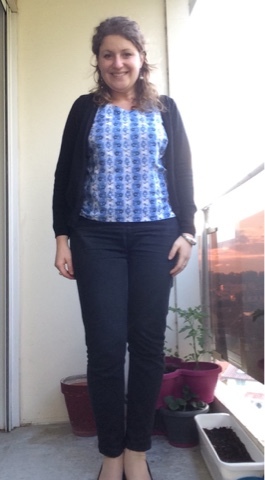 These particular jeans are instead very forgiving (I am sure they are one size bigger than necessary) but baggy. If I ever make a blog post on them, you will see what I mean. 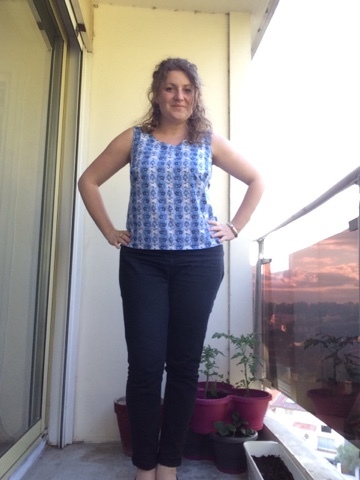 So well, the first part of MMMay has been a lot of jeans and tops, and a couple of dresses which still fit me. Also, I have cheated a couple of days, wearing something which was not handmade, and that was a cute but large tunic dress chinched with a waist-tie. 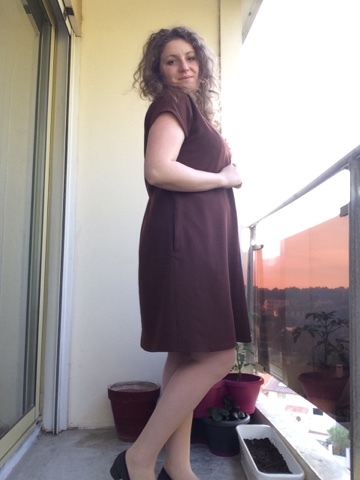 It is a really old dress which I have no intention to throw away, even if the neckline is very wide and a bit annoying and un-practical. 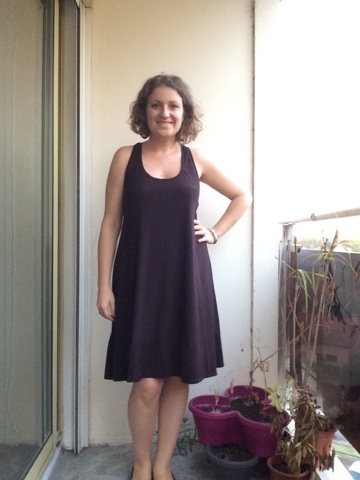 I guess this means I need to make a sway dress which can be dressed up or down, with or without waist-tie (I am looking at you, Sway dress by Papercut) and more simple dresses for everyday decontracted use (Adelaide by Seamwork, for example). 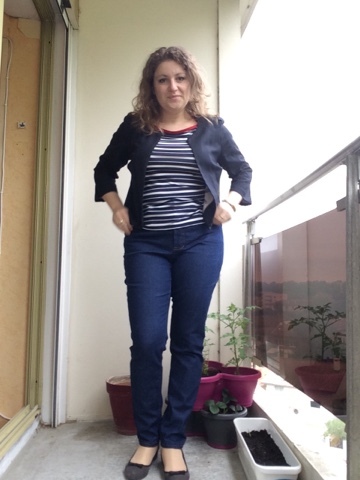 I am not planning on making new trousers or a pair of better fitting jeans, since I want to wait one month more and see if I can remove those (in)famous kilos we were talking about, just because I don't want to waste time or money in something (hopefully) transitional. One last note to sum up this first part of May 2016, is that in the magnificent Isle of Skye, Chéri officially proposed to me! Pinch me because I still don't believe it! I keep looking at my beautiful ring and smiling, I am engaged and I don't believe it yet! This has nothing to do with clothes and maybe nothing to do with this blog, but this is important news which has changed my life, so I feel like stopping people in the streets and telling them! Sharing here with you is the minimum I could do! If you are interested, in the future I can give updates on our wedding plans, but for now let me just enjoy this new-to-me feeling. 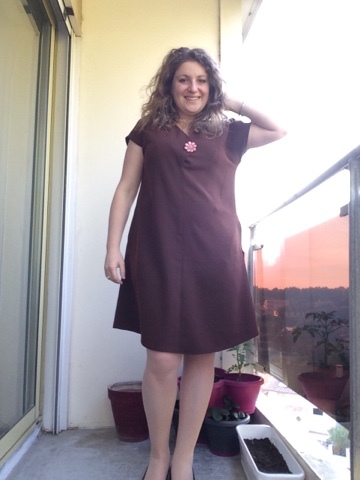 Back in February, I was lucky enough to be selected by Jennifer Lauren to test her updated Afternoon Blouse and Shift Dress pattern. I say lucky because this was the first time I ever tested a pattern (yeah), and especially because I got to have in my hands a great pattern, or rather two. Trust me I am not saying this just because I was a tester, they truly are great patterns. The Afternoon Blouse has been a classic of independent patterns for a while now, and Jennifer decided to update it to bigger size range and with a complimentary shift dress featuring the same style: choice of two decorative necklines and 1940s-inspired kimono sleeves. Yes, these are free updates! If you have already bought the blouse pattern, you just have to send Jennifer your Etsy or Paypal receipts and she will send you the updates by email. Well, onto the dress now! The pictures you see here are of the tested garments, and you can see everything is already pretty much great in terms of fitting and style, Jennifer is so talented. The final product shouldn't be much different for my size range. Speaking of size, these patterns are designed for a D cup, so I have skipped my usual FBA (hurray!) and went directly with grading: 14 at the shoulders, 16 at bust, 18 at waist, 16 at the hips. I think it worked quite well, what do you think? Let me tell you she has put much effort in larger size grading so expect this dress to fit you like a glove and grace your curves. 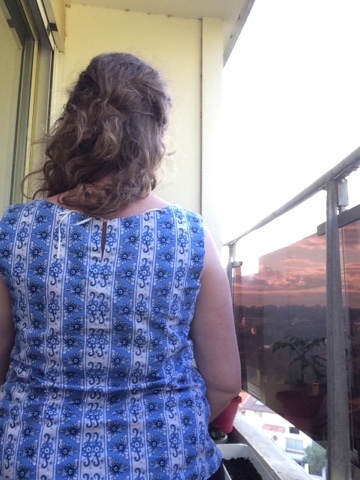 The pattern takes its name by the time you need to actually make it, and this is totally true: in one afternoon I have made one dress and one blouse, and wore the blouse to dinner with friends! I can assure you a beginner can tackle this pattern: there are few pattern pieces and it comes with thorough instructions. As a tester I can assure Jennifer put a huge effort to make the instructions clear, with schematics and explanations. There are no sleeves to set, and the only tricky points are the pivot point at the centre bust (which I kind of messed up in the blouse, but it's my fault 'cause I was sewing polka dots in the dark, you do the math), and the back boxpleat or elastic casing for the dress. Both those steps are explained in their every detail and everyone can easily follow and make something beautiful. 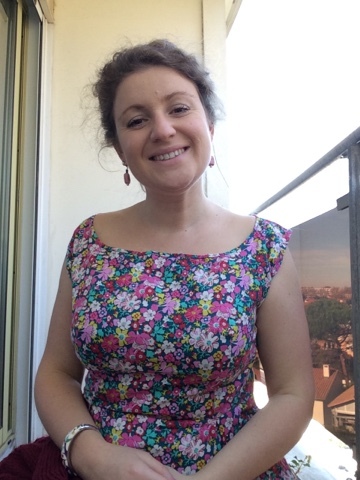 The dress is in a medium weight polyester from Toto Tissus in Toulouse, and the blouse in a light weight cotton, from Fabric Land in Bristol, present from Chéri, already used here. I love the simple plain style of this pattern, I have been wearing both garments since I have made them, at work and during the weekends. They are comfortable (no waistband, I tell you! ), but super cute. All my friends are in love with them! Even Chéri approved, and by now you know that his approval is not granted for whatever garment I sew. 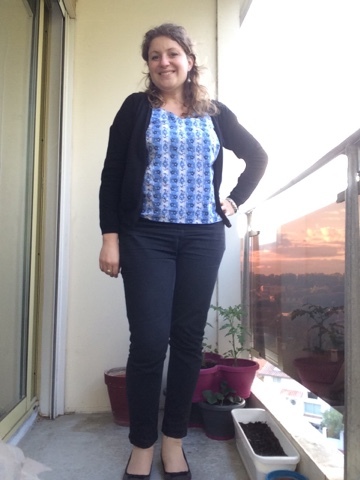 Wearing these garments for almost three months now, I am impressed by their flattering shape: you should know by now that I fear shapeless silhouettes, but this pattern checks all the boxes by being extremely well drafted, comfortable, cute and quick to sew. 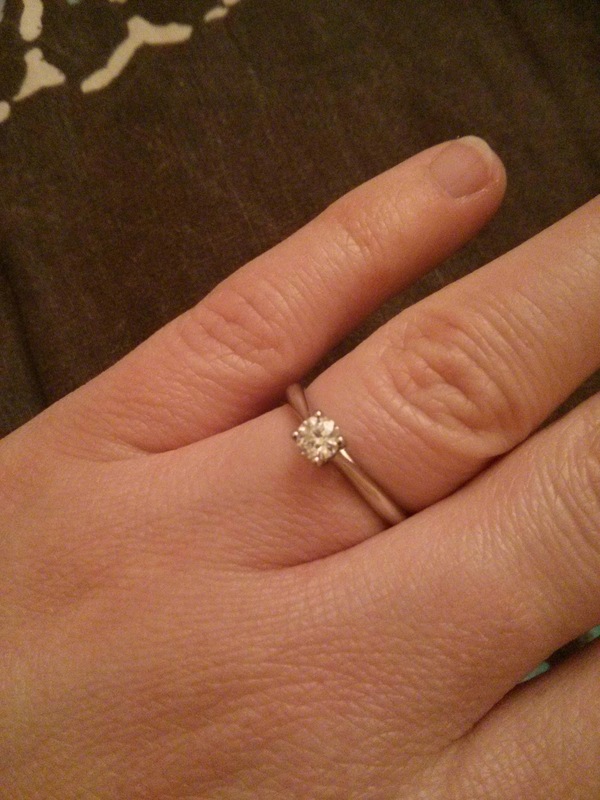 I wear it and I feel instantly pretty, and this is something to cherish, n'est pas? 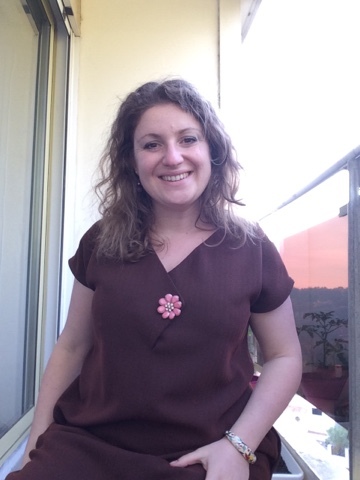 As you can imagine I will make more of them: the Afternoon blouse and shift dress is a great opportunity to showcase fabric, and to make something instantly rewarding. 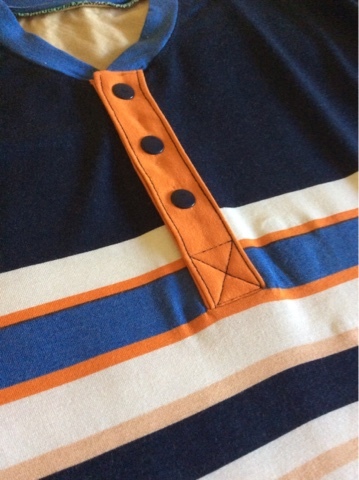 As for the central button, in both garments I have decided to omit it because I couldn't decide which style I wanted for it. I ended up using decorative broaches which I remove before washing and I can change easily to match with my outfit. 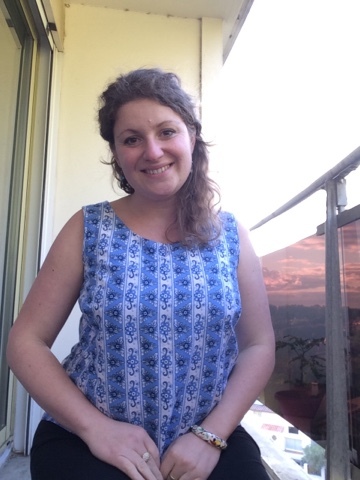 Thank you Jennifer for giving me the opportunity to test such great patterns, and for being patient with me blogging about them 3 months later, sorry! I hope everyone is doing fine. I am adjusting to my new life and still finding time to do all I like doing. Yes, I have a new life to talk about: I got a job! 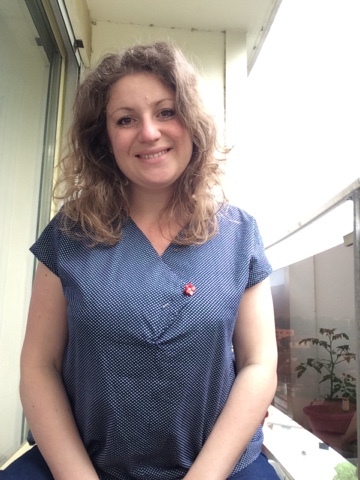 It is an amazing position (like the one of my dreams) and I am so glad all my research has paid out and I am now happy-super happy from a working point of view. The new job is in Toulouse, so I'll stay here for as long as it takes, and Chéri is doing his best to get a position at least in the same country. From this point of view life is still a bit challenging, but we are not going to be stopped by these "details": we have goals together and we will reach them! The title of this post comes from a one-week business trip I made to the Netherlands in mid-February: I went to Leiden and took advantage of the Saturday market to buy some fabric, of course! 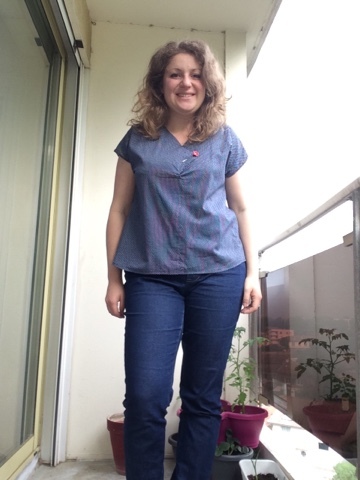 So here I am showing a very simple but cute blouse. It is from the book "Fashion with Fabric" by TGBSB authors. I have made this pattern before so nothing special to add: size 14 at the shoulders, with 10 cm FBA. With respect to the last time, in this sturdier cotton the final result is not too big but correct. Yuppy! This time I made no back buttons, only a tiny tie in the back, and shortened the back hem, to make it wearable under jackets. 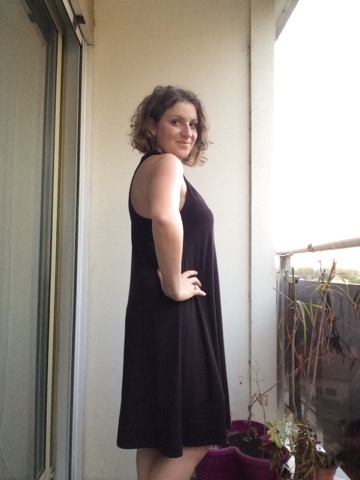 Also, no bias finishing but neck and armholes facing, and double rolled hem. 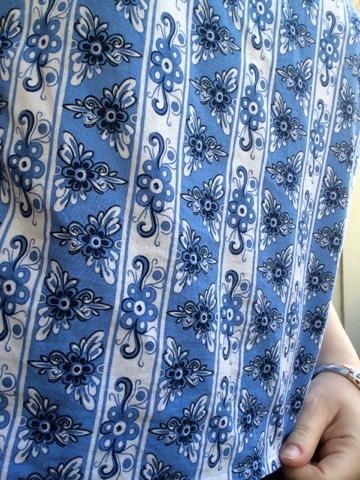 The main point of this simple blouse is of course the amazing fabric: nothing says more Netherlands than a Delft blue variation in a quality cotton. I think this would have also made a cute tablecloth (and Chéri agrees with me), but hey, I sew my clothes so I can choose to wear a tablecloth and do it in style! I had fun matching the print as much as I could with one meter fabric, and I managed to do it also for the facing, but not perfectly on centre-back seam. So proud anyway! I have been wearing it a lot at work, with a simple cardigan on top, or dressed up under a jacket, and I like to look away from the screen and see this joyful print and be reminded that I got a marvelous chance to start a new life and I'd better make the most out of it! 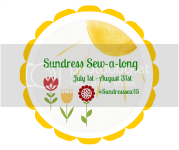 today I am sharing my very last makes of 2015! First up a drapey dress included in the book Fashion with Fabric, by the authors of The Great British Sewing Bee. I fell in love with this dress since it appeared in the book blog tour, and have been hunting the perfect fabric for a long time. Finally I found the exact grey Ponte di Roma I was looking for. It was in Toto Tissus in Toulouse and the price was affordable. 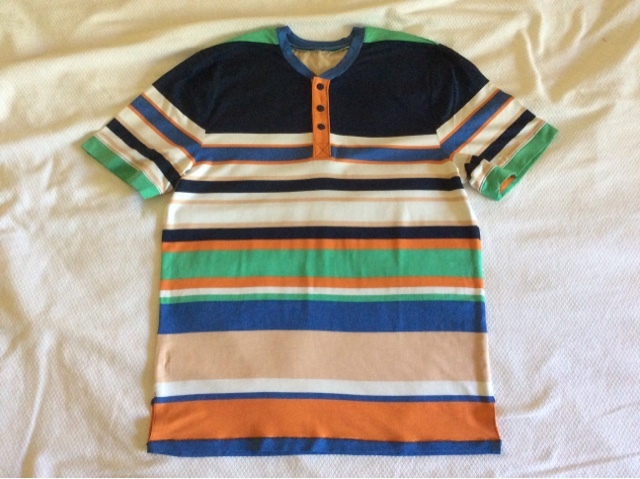 I cut a size M and made no modifications. The fit on the model was quite generous and I was ever so afraid of the potato sack effect. We all know boxy designs don't compliment my silhouette (or lack thereof). I now think I should have graded to an L at the hips in order to make the fit more fluid on me, cause looking at the pictures I have the impression that the dress stops at the hips and a lot of fabric is kept at the waist, giving a not so nice pregnant lady effect, especially when you are not pregnant. Oddly enough I don't hate the back view, which almost never happens to me. 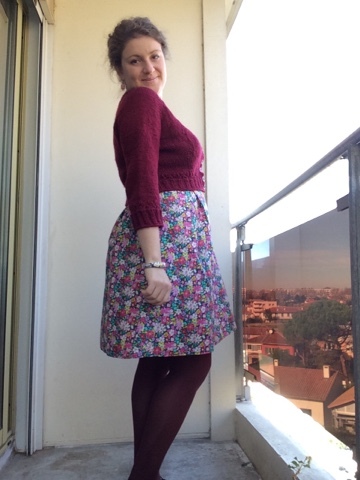 It was my first time sewing Ponte di Roma and I truly enjoyed it! The two main features of the dress are the generous inseam pockets and the asymmetric front design. They don't show in this fabric and in these pictures, but you have to trust me that in real life they are amazing features and I have received a lot of compliments. 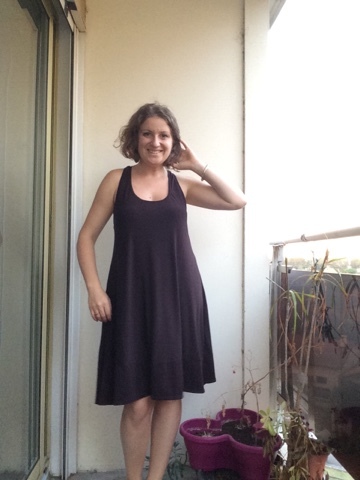 I made this dress at the beginning of November and it has been ever since in constant rotation, with brogues or boots, under a cardigan or directly under the coat, given the mild autumn and winter here in Toulouse. I brought it to Italy for Christmas holidays and I have enjoyed it a lot! 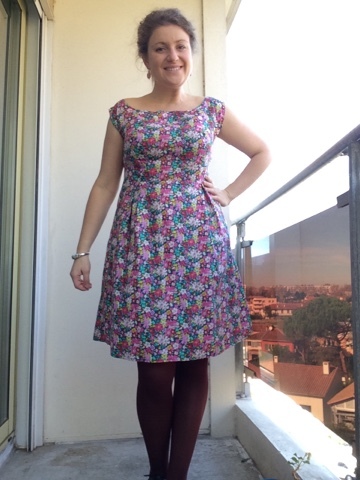 Despite the fitting issue I love it and I might make it again! A nice side note is that all the pictures of this dress were taken by Anne Lise and Magalie. Thanks girls! Now for the very last make of 2015, you have some awful bathroom selfies. Sorry but this is a present and I finished it quite last minute, so I definitely had no time for proper pictures. 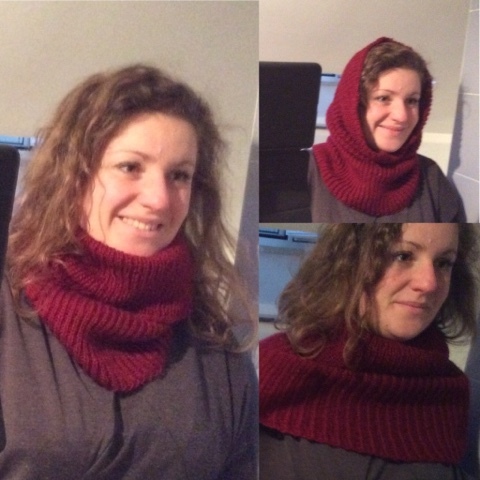 Well, it is a snood/cowl I made for my friend Manu. She can wear it all folded, over the head or over the shoulders. Construction-wise is quite simple, just endless 1x1 ribbing and a few augmentations towards the end. The pattern is free on Ravelry. When she opened the present she loved it and the look on her face made me so happy! 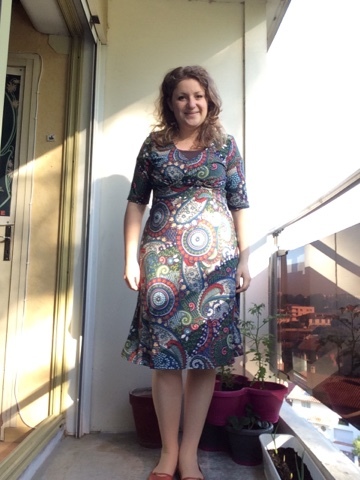 After my last post where I stated I only sew what I had planned to, I thought it was nice to share a new dress which was not planned at all. The purpose is to show that I can change my plans, and to share a cute dress, of course. 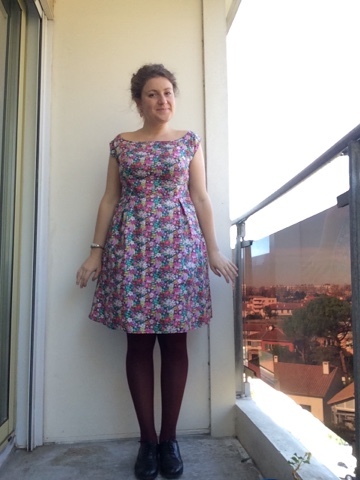 It is the Bardot dress, by Simply Sew, attached to Love Sewing Magazine. 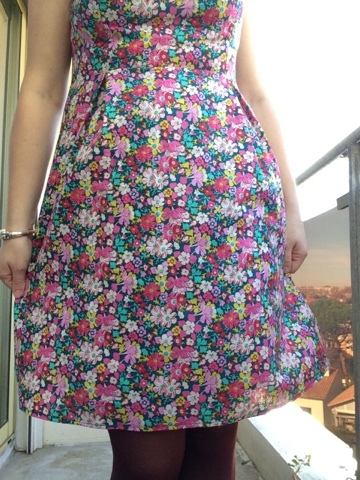 The main reason I decided to jump the gun and make myself a new dress is this lovely cotton by Liberty. My Chéri sent me 3 m. as an unexpected birthday present. We live far apart but when I opened the parcel and touched the fabric, my heart skipped a beat thinking that he touched and chose this fabric for me. He said that choosing fabric was not so easy as it may look. I hope now he will better understand why I spend hours inside fabric shops. 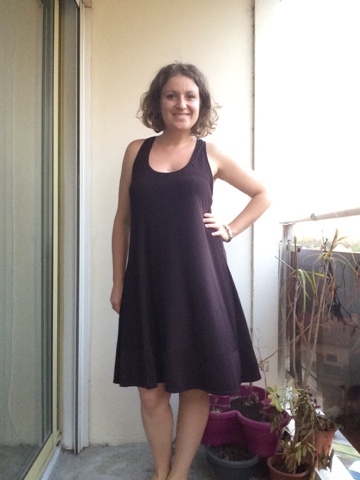 We were supposed to meet a few days later in Rome, so I immediately prewashed the fabric and made this dress in one day, just to surprise him: when we met, I was wearing it and his jaw dropped! The main feature of the dress is the wide boat neckline, finished with self bias. It is flattering and sits very nicely. As usual with Simple Sew patterns, I cut a size 14 at shoulders and bust, graded to size 18 at waist and size 16 at hips, then made a 1,25" FBA. This is now my recipe and it works well. I chose to make cap sleeves to save fabric and now have one meter left. They are not visible on my dress because of the busy print, but the sleeves are raglan. 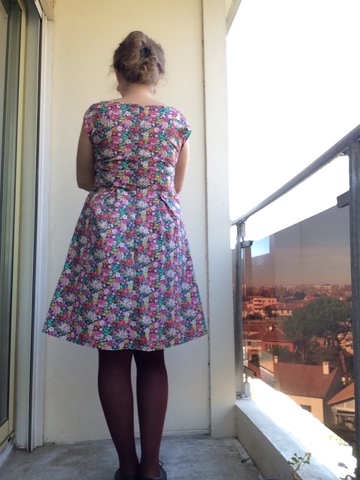 I am proud of my pattern matching between bodice and skirt! For information, I am wearing my petticoat under it, but next spring and summer I am going to wear the dress without it, and with bare legs. The dress features four inverted pleats at the skirt, two at the front and two at the back. They look wide open, and this is maybe the only minus of the design, for me, because it looks like I am exploding them. Well, this is a quite minor minus, if you allow me. The general silhouette is very cute and flattering, from the front, from the side and also from the back, which almost never happens to me! 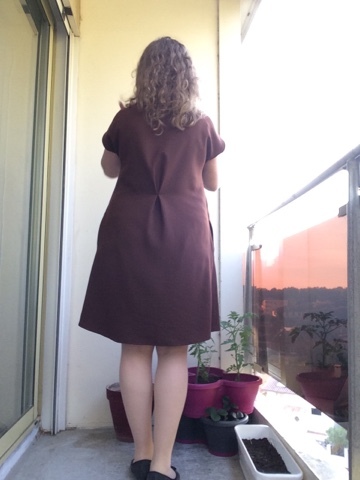 After making the dress and being very happy about it, I regretted that the colours are not quite adequate to autumn for my style, but I have been wearing it with opaque tights and my perfectly matching Miette cardigan, so this dress stays in rotation for a few weeks more. I think the resulting outfit is quite cute. 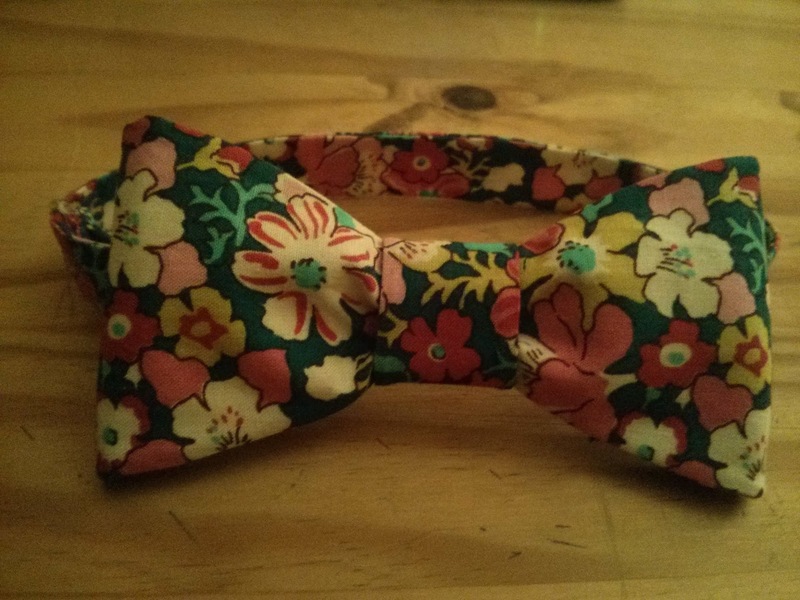 As a last surprise inside the surprise after the surprise, I made a bow tie with the scraps. 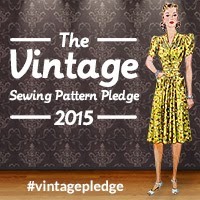 The pattern was in the April 2015 issue of Love Sewing magazine. Chéri was delighted with it and we had a lovely (but brief) weekend together!